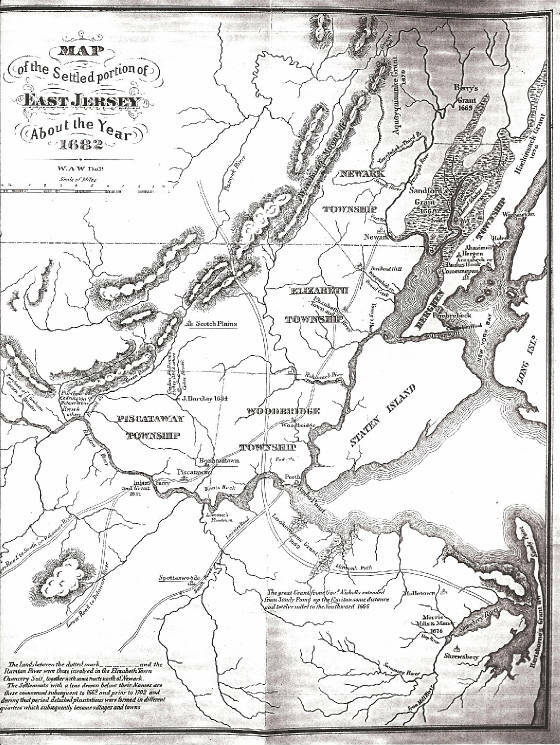 In 1682 the Duke of York formalized the territory he had aquired from the Dutch 20 years earlier with a grant to 24 Proprietaries of East New Jersey. Among them was Thomas Warne who held thousands of acres in Middlesex and Monmouth counties, including the land between Matawan Creek and Gravelly Brook. After working off his indenture, in 1686 Peter Watson and 23 other "Scott Presbyterians" bought and divided up 100 hundred acres of land from Thomas Warne in "Warne's Neck" on Gravelly Brook in the vicinity of "Mount Pleasant" (shown to the left from the "Matawan 1686 - 1936"). This particular section first came to be known first as "New Aberdeen" later to become "Mount Pleasant" (Freneau would adress his letters "Mount Pleasant near Middletown Point", "Middletown Point" was the first name for Matawan proper to the north). "Mount Pleasant" became part of Matawan Township, then the name was changed in 1889 to "Freneau" in honor of the poet, and finally it was annexed back to Matawan Borough. As further described in "New Aberdeen": "Peter not only had his house lot in Matawan, but a large plantation adjoining it". As described below, Peter's land on Gravelly Brook would become the Freneau and then Leadbeater estate, and later the Magnolia Farm. 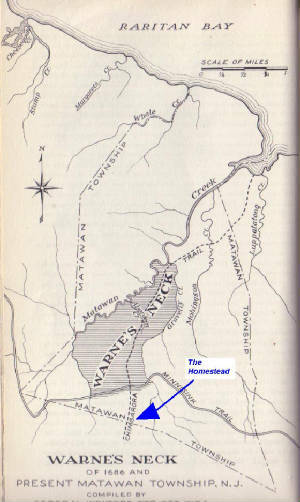 The homestead (where my house is today) is indicated on the map above, just below Warne's Neck, and extended into what is now Marlboro. To the right is a discrption of land on Gravelly Brook Peter obtained in 1688 from John Reid and an adjoining 400 acres in 1715 from John Johnson. Below is the earliest known map of the area drawn by John Reid himself around 1685. The blue arrow points to John Reid's property that Peter Watson likely bought as it correlates fairly well to the description above, and the location of the eventual Freneau estate. To the left of Reid you can see the Johnson property and Gordon is mentioned also (but not in location from the 1688 description ). Below from Stillwell's is a description of the Hoge transaction that he believes eventually becomes Freneau's. Hoge is not shown on the Reid map, but the hoge transaction was 15 years later so some property could have easily changed hands in the interim. However without a precise location its difficult to confirm the Hoge land became Magnolia Farm, and so the first Watson purchase from John Reid or Johnson stay the likely candidates. There is also a 1702 deed of 400 acres from Robert Burnet, a tract from Robert Barclay, and others, so it is easy to see how Peter Watson amassed the fabled "1000 acre" estate. 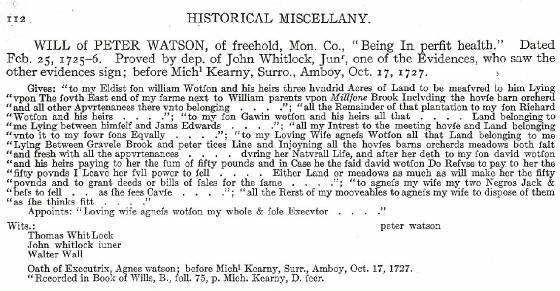 Below from Harrison McNear's "Unrecorded Wills and Inventories- Monmouth County New Jersey" is Peter Watson's will. As we read, Peter Watson willed land on the Gravelly Brook to his wife Agnes for life. Upon her death the land was to go to his son David. Another one of Peter's sons, Richard, was Philip Freneau's maternal grandfather. Peter Watson died in 1727, in that same year Agnes (Philip Freneau's mother) was born. Peter Watson's wife Agnes died in 1729. Ten years later in 1762 David Watson "in consideration of the natural love and affection which I bear to my sister Agnes Freneau, wife of Peter Freneau, gentleman", deeded to Phillip's father the hundred acre homestead along with nine other lots in Matawan, another 100 acres at Boles's Mills, and a saw mill and thirty acres on the creek. And so it was the industrious and hard working Peter Watson (who went from indentured servant to land baron), and his son David, that would sustain both Philips father and Philip himself for over seventy years until, at the age of 72, Philip would do the same as his father and move to take possesion a farm previously owned by HIS wife's brother- Denise Forman. Philip M. Marsh who wrote multiple books and articles on Freneau including "Philip Freneau Poet and Journalist" and a number of articles for the proceedings of the New Jersey Historical Society including "Freneau's Last Home" in the April, 1939 volume; Lewis Leary who multiple books including"That Rascal freneau- A Study in Literary Failure", and also contributed articles to the New Jersey Historical Society including Philip Freneau and Monmouth County for the July 1948 volume; Mary Austin's "Philip Freneau- The Poet of the Revolution"; the WPA writers "New Jersey- A Guide to its Present and Past, 1939; New Aberdeen or the Scotch Settlment of Monmouth County New Jersey, James Steen 1899; Matawan 1686 - 1936, Written and Illustrated by the Federal Writers Projects, 1939; Documents relating to the Colonial History of the State of New Jersey, V 21; Evert A Duyckinck; Historical and Geneaological Miscellany- Early Settlers of New Jersey and Their Decendents, John E. Stiwell MD, 1937; This Old Monmouth of Our, William Hornor, 1932; Unrecorded Wills and Inventories- Monmouth County, New Jersey, Harrison McNear; and others. Images of the Freneau family bible, John Hammels notebook at the from the Monmouth County Historical Association Freneau Collection, deeds, newspapers especially the Red Bank Register, Matawan Journal and New York Times, and other historical documents. Also special thanks to Stephen Gale, an Architectural Research Consultant, who shares a common interest in Freneau and his lands and is helping me research.